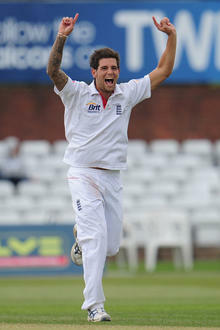 Dernbach called up Keep up to date with England’s progress against Sri Lanka with our in-depth day-by-day reports – plus all the reaction, squad for the second npower Test at Lord’s, commencing Friday June 3, after James Anderson was ruled out due to a side strain suffered during the first npower Test in Cardiff. otherwise unchanged squad of 12, remains uncapped at international level despite being called up to England’s ODI squad for the ICC World Cup quarter-final against Sri Lanka in March. Dernbach was not selected to play in that match but recently collected nine wickets for England Lions in the tour match against Sri Lanka. Anderson suffered a grade one side strain during England’s first innings in the first npower Test and will continue to receive treatment and rehabilitation before a decision is made on his participation in the third and final npower Test at the Rose Bowl, starting June 16. 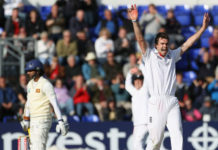 National selector Geoff Miller, said: “It’s obviously disappointing to lose Jimmy Anderson for the next Test as he is world-class and the leader of our attack but we’re fortunate to have a healthy stock of pace bowlers at present. “We’re hopeful Jimmy will be available for the third npower Test but in the meantime we’re excited by Jade Dernbach’s inclusion. 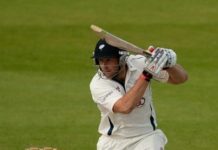 ECB chief medical officer, Dr Nick Peirce, said: “The nature of Jimmy’s injury is a grade one tear which is a low-end injury but given it’s a side strain we need to proceed cautiously which is why he has been ruled out of the second npower Test at Lord’s. “We have also taken into account the short turnaround between Test matches and we feel it is best for Jimmy to spend the next week receiving treatment and rest in order to give him the best chance for selection for the final Test in the series.